You will earn 701 Reward Points. Earn 1 reward point for every 1 dollar spent. Attractive colorful graphics to enhance impulse sales. Fits almost anywhere requiring only 21” of counter space. 6 oz. nickel plated steel kettle for maintenance free operation. Clear Lexan serving drop panel provides great visibility and easy removal for cleaning. Heated stainless steel corn deck to keep your popcorn fresh and crisp when you want to snack. Stainless steel removable old maid drawer for easy separation and removal of unpopped kernels. Two clear Lexan doors have full length aluminum hinges with magnetic catch to stand up to consistent use. Pops 135 one ounce servings per hour of quality Star Chief’s Choice brand popcorn. (Contact factory for details). Three 1/8” thick clear tempered glass panels with aluminum corner posts for easy cleaning and excellent merchandising. Whether its a quick snack or an addition to a meal, JetStar commercial popcorn machines are built to last. The JetStar 6 oz. popcorn poppers are ideal for snack bars, convenience stores, taverns, restaurants or any place you want to pop delicious popcorn. Contains a 50 watt heated stainless steel corn deck and a stainless steel old maid drawer. A 6’ cord and NEMA 5-15 Plug are standard. The 6 oz. JetStar family of popcorn poppers are outfitted with a nickel plated steel kettle, stainless steel exterior shell and a 1000 watt kettle heating element. Units are constructed of 1/8” thick tempered glass panels and four extruded aluminum corner posts. Units have two 3/16” thick Lexon doors with full length aluminum hinges and clear Lexan removable drop panel. JetStar 6oz poppers are covered by Star’ s two year parts and labor warranty. 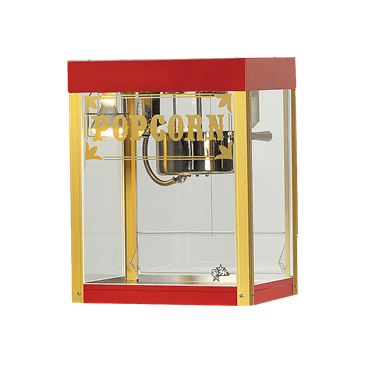 Popcorn machines are constructed of extruded aluminum corner posts and 1/8" thick tempered glass panels. Unit is provided with two 3/16" thick plexiglass doors with full length aluminum hinges with magnetic door catch and clear lexan serving drop panel. Popcorn machines are supplied with a 1000 Watt, 6 oz. capacity nickel plated steel popping kettle with a stainless steel exterior shell. A wire cage protected 75 watt display lamp, 50 watt heated stainless steel corn deck, and stainless steel old maid drawer are provided. A 6’ cord and NEMA 5-15 plug for 120V, a 6-15P for 240V and CEE7-7 for 230V are standard. Poppers are approved by UL and NSF. Printed in the U.S.A.